The River Ching is a strangely unremarked watercourse which barely registers on the inventory of obscure London tributaries. It doesn't go anywhere of consequence, describes no occult arcs and bubbles fairly unimportantly through boroughs which don't regard it as a feature to be cherished or advertised. It rises to the north of the bridge on which I first caught sight of it, just beyond Connaught Water, and joins the Cuckoo Brook before passing below the bridge on which I stood and heading south into a wooded valley which skirts the high ground of Chingford. Here at Ranger's Road, the rather lively, narrow stream linked the great expanse of woodland to the north with the tail of the forest which still curls southwards and encroaches on the city. 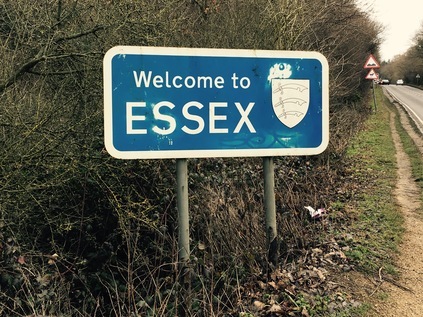 I crossed the street and passed a vehicle barrier before disappearing among the ancient trees of Essex. Initially there was a well made track with a screed of sand and stone underfoot, but as the path edged around the fence of a large property, the trail became a muddy bridleway. I passed a pair of horses being ridden back towards the road, their haughty riders not returning my acknowledgement, and then I was rather suddenly alone. The ground in the forest was thick with golden oak leaves, some slowly mulching into the sodden, black earth. This wasn't a result of the melting ice or a recent downpour - this woodland floor had absorbed the rainfall over long, wet centuries. It was probably never fully dry. The aroma of decaying wood surrounded me and twists of holly and ivy curled from around the bare trunks of the oaks. Slowly, as I pressed onwards, carefully keeping my feet out of the worst of the mud, the sounds of the suburbs receded completely. Rather suddenly I burst into a wide open space where the cloud cover had broken enough to let shafts of sunlight reach the frost, clearing it in broad patches. Whitehall Plain appeared to be a pleasantly grassy field, but on closer inspection was in fact a marshy trudge. The earth sucked at my boots as I tried to walk the edges of the path, using the deep tufts of grass for extra traction. It was hard to resist breaking the ice on the horseshoe prints, but I was already conscious that my boots and trousers had a thick covering of pale, Essex earth and couldn't risk an ankle-deep mud puddle. I made for the southwestern corner of the field, where a gap in the trees indicated the makeshift trail continuing south. The map was only partially useful here - this trail didn't officially exist, and I confess to some anxiety that I'd come a long way on fairly tricky terrain. Retracing my steps didn't feel like an edifying option at this point. At the corner of the field I was faced with a choice - and with a close encounter with The Ching which babbled invitingly close to the path. A small bridge crossed it here, but it was beyond a huge slimy pool of mud. I wasn't really sure that this was the correct way ahead - but the lure of the water was strong. I edged closer, finding the undisturbed ground at the river's edge more walkable. Suddenly, and rather surprisingly, I found my toes dipping into the watercourse. As the mud from my boots clouded the little stream and washed them clean, it occurred to me that this was the first time on my many riparian walks that I'd physically made contact with a river which I was walking. It was an odd experience, but satisfying too to see the patch of muddy water billowing away from me. My shoes didn't stay clean for long - after the bridge, the path disappeared into the undergrowth in a way which suggested it was far less substantial than the one I'd left before crossing the river. This couldn't be the best option - so I edged back over and through the tricky swamp to regain the path I'd left at Whitehall Plain. I was soon in a second wide field and making much better progress, occasionally the sun flickered through the trees and my footing felt steadier. A jogger appeared, huffing along the path towards me. I could feel civilisation returning. My brush with the suburbs didn't last long - I crossed Whitehall Road close to the point where the Ching passed beneath a decorative but otherwise inconspicuous concrete parapet. At the other side of the street there were paths on both sides of the river - but the western path, running close to the back gardens of a crescent of houses, was just a little less muddy and overgrown in appearance. I was soon trudging along close to the meandering river once again as it ambled between the trees. It was cool and quiet beneath the canopy of branches, and now that I'd found my feet a little I felt able to wander confidently along the trail. Occasionally I'd dare to stray a little off the path to the bank of the river as it curled between the venerable trunks of the forest. The water was clear and free of litter here - and I found myself wondering how it would look further along it's route. As I shuffled through fallen leaves back towards the path I spotted a sleek, red fox standing watching me ahead. I slowed my pace and locked eyes with the remarkable animal, which didn't budge at all. It stood calmly regarding me with interest and perhaps some suspicion as I crunched along the stony track which had replaced the mud. Eventually, with only a few feet between us, the fox flattened itself to the ground and launched swiftly into the ferny undergrowth. I halted and stayed quiet in the hope of perhaps catching another glimpse - but all was silent. I checked my map - this track formed the access to a nearby house, and even had a name - Newgate Street. Suddenly, and unexpectedly, I found myself at a busy roundabout with the Ching passing underneath. A miserable drizzle was falling, and the cars were kicking up a dirty spray as they shuddered by. I spied a range of shops leading towards Chingford Hatch and headed that way to get a drink. As it happened, a small filling station with a general store was the nearest option and I slipped inside to avoid straying too far from my plan. As the door opened I was immediately hit by the acrid reek of over-cooking cheese - the powerful fumes from the Subway concession almost drove me out before I could grab a bottle of water, and certainly put paid to any hunger which might have been rising. As I tried to hold my breath through the achingly slow transaction, the sales assistant appeared utterly unconcerned by what I was now convinced was some sort of emergency in the back of the garage. I was glad to be back outdoors in the clear air of the cold, grey morning again. Many of the rivers I've walked disappear entirely at this point, submerged into culverts which sneak under the city, leaving me seeking telltale signs of their presence beneath. But the Ching remains almost entirely above ground, even when it cuts across the lower reaches of Chingford towards the Lea Valley. That's not to say the river is always accessible, and I realised that my route here was at best speculative. The Ching flows between the back gardens of long terraced avenues, and marks the boundaries of inaccessible school fields for much of this part of its course. But first I had to pass under the railway, with the river in a narrow channel beside me as I turned into the accurately named River Walk. The yellow brick viaduct arched over both the path and the Ching - but the Network Rail information panel identified the watercourse only as 'Stream'. At the end of River Walk, an end-of-terrace house was decorated with a mural depicting a white owl in flight, and urging me to respect nature. Here the river once again disappeared between streets of pleasant victorian terraced houses, and I had to detour around these to get to yet another school where a shared cycle and footpath joined the waterway again for a brief stretch. On the other side of my path tall blocks of modern homes were being built - the first of them already occupied, bored children staring down at the footpath - on the site of Walthamstow Stadium. 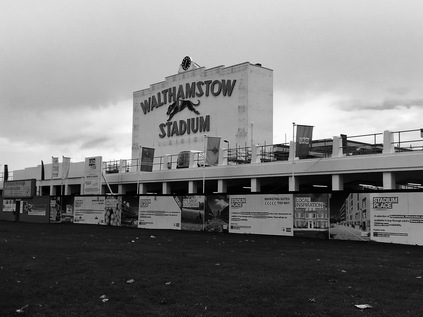 The map showed the distinctive oval of the dog track preserved in the footprint of the new homes, it's iconic fascia memorialised to front the development. The white wall with its distinctive lettering looked like a bright and stark headstone against the grey glass behind it. It was the spectre of a place - a lost memory that meant little to the families which now lived behind it in Parade Gardens. The river disappeared briefly underground here to pass under Chingford Road - a busy tide of traffic prioritised over a few of us hapless pedestrians navigating a complex of crossings. When I finally arrived at the other side of the road, the river re-emerged, sluggish and clotted with junk, beside the access road to a vast Sainsbury's Superstore. The temple of retail was so huge that a Holiday Inn had been enveloped by its car park - or perhaps shoppers needed to break their visit and rest overnight after trudging the endless aisles? I braved the store, needing food and facilities. It felt a little odd to be surrounded by impatient, jostling humanity after my solitary forest walk. Emerging from Sainsbury's refreshed, I noted that the early promise of sunshine was finally being delivered. The wet car park shone back at me, and I tried to appear as unassuming as possible as I slunk off to the edge of the site near the delivery bays where vast juggernauts of produce were disgorging into the store even now. On the map at least, a footpath appeared to edge around the site, shadowing the Ching as it wound around the regenerated footprint of the infamous Chingford Hall estate. I found the path, and followed it until it finally petered out at the edge of a further huge supermarket. While the bank of the river looked walkable for some distance ahead it was fenced off and marked as private land, with dire warnings for trespassers. I negotiated the edge of the supermarket car park and took a footpath leading into the quiet streets of the estate. Chingford Hall was one of the large-scale housing developments which promised so much in the 1960s, but became synonymous with urban decay and fear in later decades. Its towers were felled, one by one, and by the early part of the 21st century it had risen again in its new form - low-rise blocks in defensible cul-de-sacs, utility blocks with local shops and pubs, public space and playgrounds. But despite following the 'Secured by Design' playbook, Chingford Hall is still troubled by tensions between gangs, poverty and isolation. The local pub was derelict and open to the elements and the chip shop owner was nervously eyeing a gaggle of youngsters staging a half-hearted food-fight across a table. The quiet Saturday afternoon was palpably tense in a way I rarely sense in inner London nowadays. The roads mocked the river's hidden passage: Burnside Avenue, Ching Way. My escape from the estate was to be via more familiar territory - and since I'd left the supermarket I'd been able to detect the drone of the ubiquitous North Circular. At the end of Ching Way, a curved brick entrance opened onto the A406 near the point I'd crossed it months ago. On the estate-facing side of the wall an ancient VCR had been hurled at the ground, splaying it's archaic electronics across the path. I stepped over it and into the maelstrom of fumes and noise beyond. It was like stepping into a wholly different world. And perhaps this mad screed of traffic marking its border is why Chingford Hall feels so inescapable? The road marks a division between territories. Crossing the footbridge seems ill-advised, and the boundary must be defended. Despite standing above six lanes of pulsing hydrocarbon fumes, I felt able to breathe without the tight knot of tension which I'd experienced in the estate. Descending from the footbridge, I felt oddly at ease. I was in familiar territory. The vast white slab of Costco rose above the trees, and signs at the litter strewn junction of Folly Lane and Harbet Road promised more industrial estates nearby. 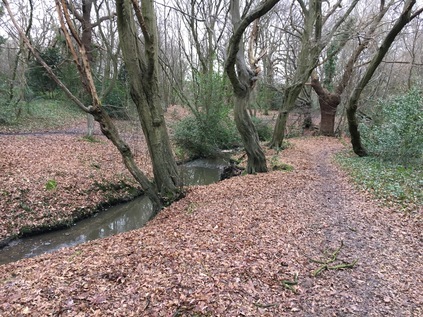 The land here is flat and open - part of the wide plain at the bottom of the Lea Valley which is filled with a tangle of watercourses and crossed by only infrequent arterial routes. As the North Circular bucked and swerved north towards Edmonton and my recent encounters with other tributaries, I turned west. The Ching was canalised here, running in a deep concrete channel with powerlines strung overhead. The lowering sun glinted from the water, and the clouds rolled dramatically over the valley. The conditions were perfect for this liminal zone, and I found a new eagerness to walk. There was only a little more of the tiny but persistent river left as it delved, arrow-straight towards the Lea. The road weaved around a pumping station complete with attractive workers' cottages, before crossing an aqueduct carrying a man-made drainage channel parallel with the Lea. Then suddenly, I found myself above the Lea, looking at the opening of the Ching's culvert. After passing under the aqueduct the river ended inauspiciously, joining the Lea as it curled around the banks of Banbury Reservoir. The sun was low over the water, and the march of pylons was a line of brooding shadow-walkers. I paused and tried to connect the tiny brook in the forest with this green, oily ending. It had been a brief journey in terms of distance - but it occurred to me I'd probably been able to stay closer to the route of the little River Ching than I had when walking other streams. I navigated the tongue of land which housed a rapidly disappearing industrial estate. I'd walked here only a few months ago and all had seemed intact, but now buildings were hollow shells with last year's calendars flapping on their exposed interior walls. I learned later that this woudl be part of Meridian Water - a new suburb rising from the dust of Edmonton, mercifully upwind of the Waste Incinerator - at least most of the time. This eastern part of the site will be reserved for employment, and linked to new housing by means of The Causeway - presumably an upgrade of the deeply pedestrian-unfriendly bridge carrying the A406 towards Angel Road station and the west. 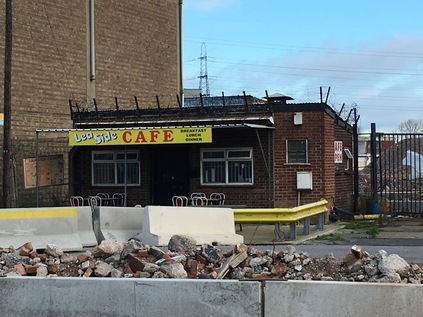 Looking back, I didn't consider these vistas threatened or this land desirable - but now the bright frontage of the tiny, closed greasy spoon caff on Towpath Road seemed oddly poignant. As I walked south the wind carried the weird, disembodied cheers and songs from White Hart Lane over the valley, away from the bright halogen of the floodlights. At Stonebridge Lock I rested outside the fine little café which seemed a world away from it's near neighbour just along the river. While the informal and friendly owners shambled around preparing drinks and snacks for the surprisingly steady flow of visitors, cyclists relaxed in the sun and thirsty dogs ambled around their owner's feet. I bought a coffee and sat outside, resting my legs and contemplating pushing on further than Tottenham. I felt better than I had for a long while, and I thought I could manage it. But I also wanted to rest and mull over the strange contrasts I'd experienced today. The bright winter light was lowering to the south west, and the Lea Navigation was a reflective river of black water. 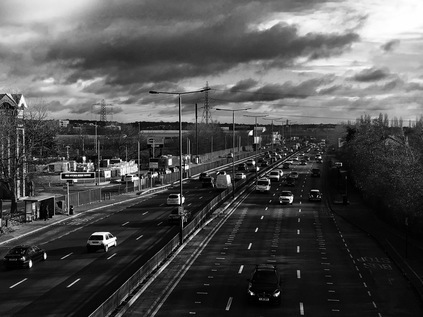 The edges of London are constantly torn and remade but somehow its waterways persist - in the margins of developments, delineating parcels of land, and rising in protest at being curtailed or culverted. Choosing to walk these ancient routes has linked the disjointed fringes of the city in a way I'd never have expected. I sipped my coffee and contemplated my next move. You can see a gallery of images from the walk here.